!!! 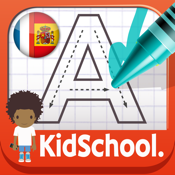 KidSchool has been selected at the Wouap Doo Apps Trophy 2012 !!! KidSchool is a collection of games imagined by a mother and created by parents for your children ! "Write and Draw my first Alphabet" is a game based on the idea that you learn better when you play! Your Child will listen to the sounds of the letters in french and spanish, learn to write each letters and have fun coloring objects and animals in each page. The game includes 26 letters in 2 languages and 52 coloring.